DURAMATRIX Creasing Matrix are fitted to die cutting plates or cylinder jackets in die cutting and creasing applications and act as part of a “make ready” counter die system into which the Creasing Rules end their down stroke and create a fold in the paper or card. Creasing Matrix is self-locating and therefore ensures precise register between creasing rule and matrix. It also enables guaranteed location of the matrix first time and reduces downtime of the machine. For customers accustomed to choosing “self-locating” matrix. Steel Matrix is the most well known and popular matrix type. Easy identification of Matrix size by colour coding. Matrix width (B) = 2 x material thickness (C) + rule thickness (D). Height of creasing rule = Height of cutting rule – Depth of matrix steel (0.225mm/0.09”). This is the easiest Matrix to introduce for customers using handmade creasing channels. Easy identification of Matrix as locator is colour coded by the depth of the Mtrix. Large range of sizes to suit more applications. For customers using board based creasing channels. Newest and most durable line. Colour coding on base of the matrix allows easy recognition. Specially formulated adhesive on the underside holds the matrix in place securely throughout even the long runs but it easily removable leaving no residue on the cutting plate or jacket. Easily cut and fitted to the die before or after the die is put into the press. No specialist installation or preparation required. Locator fixed with special light adhesive that ensures that matrix stays in place when locator is removed. Angled outside edge of matrix to prevent jamming as the paper or card passes through the machine. Strong and durable matrix wall. Narrow width of matrix means that steel based matrix is suitable for tight creasing and small packaging jobs. Film based matrix means no need for change of creasing rule heights. Chamfered finished edges avoid snagging of the board during high speed creasing. 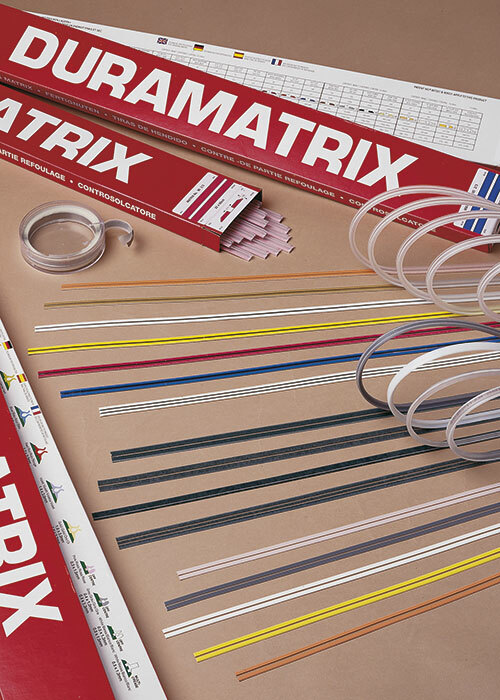 Narrow width of matrix means that plastic based matrix is suitable for tight creasing and small packaging jobs. Shim Tapes – double sided adhesive tapes used to “pack out” the matrix for improved creasing. Clean cutting plates or jacket ensuring all grease and oil is removed. Cut matrix to required length. Apply matrix locator to creasing rule. Close machine and complete one cycle to allow matrix to affix to the cutting plate or jacket. Press is ready to run with matrix in perfect register with creasing rule.